If you had spent lots of thousands of pounds on a shiny new race engine you’d want to keep it safe. 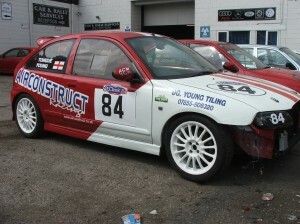 When this ZR Trophy spec race car was fitted with it’s new 200BHP Janspeed built K series the owner was told he must be careful not to let the oil overheat. 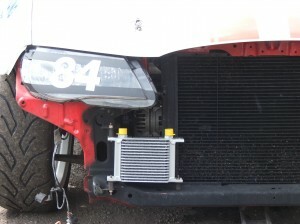 Oil temperature has never been a problem in the past due to the oil/water intercooler fitted but now an extra oil/air cooler was required to satisfy Mr Engine Builder. Space behind the bumper wasn’t a problem but mismatched pipe threads, odd bore sizes and torturous pipe routes meant this job used a whole weeks worth of swear words in one day. It all went together in the end and now if the engine goes bang we know it’s the driver’s fault… Not that racing drivers ever make mistakes of course.